Advanced rights for Senior District Webmasters are currently available by request only. Once enabled for a district, all Senior District Webmasters will gain these rights. With advanced rights, you may move and delete all homepage modules as well as add new modules wherever you like. Some modules include previously unavailable format options. Locked settings still apply to site webmasters. If desired, you may change the locked state of homepage modules for site webmasters. Select the module you wish to lock, then click the Lock icon on the toolbar. 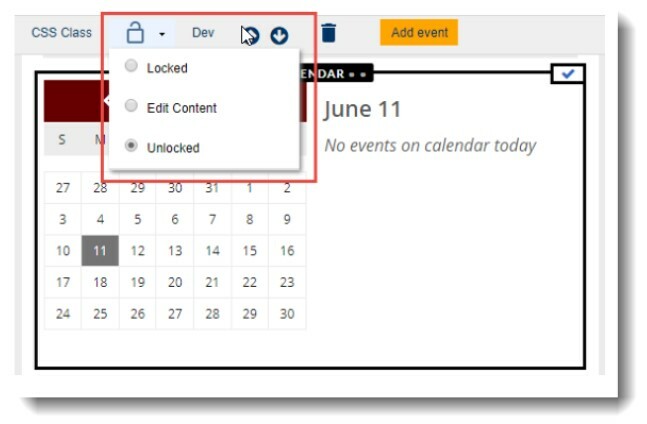 There are 3 lock statuses that determine whether or not the content is editable and whether the module can be moved or deleted. See the table below for an explanation of each locked state. With advanced rights, you can access the hidden layers of a template for full control over layout, but be aware that the template layouts are extremely complicated and might give way to confusion. If this happens, you may revert to an earlier version of the homepage. See the section at the bottom of this guide if you need to recover an earlier version of your homepage. For any selected module, the layer menu is on the far left side of the Toolbar. The last option in the list is the selected module. As you move your cursor up the list, the layers are identified with a black border. In the screenshot below, the selected row contains a column, which contains the Link List Module. Click a layer in the menu to select it. Selected layers will have various options on the toolbar. Some layers include a trashcan icon. 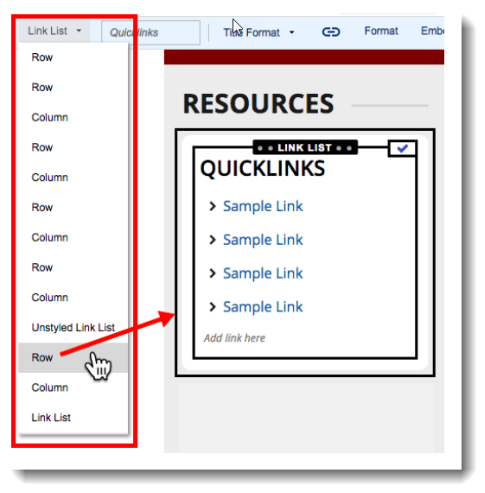 Caution: Deleting rows and columns from your template is liable to break the layout. Use the Cancel button if you realize you've made a serious error. If the mistake was saved, then see the section at the bottom of this article for reverting to an earlier version. Changing the number of columns in the mega menu drop down menu. Inserting a multiple column layout. To edit, copy and delete templates, head for the Admin Center, click the Templates tab (1) and then the Edit button (2) (see example below). It does not matter which of the templates is selected when you click Edit. 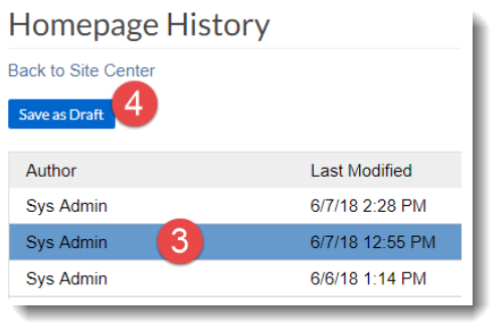 On the left side of the page, select the template you wish to edit, copy, or delete (1) using the icons to the right of each template name. Editing a template works just like editing any page on your website. The Show Locking button (2) (seen above) allows you to see which icons in the template are locked. Locked modules will display a red border. To change the locked setting for a module, select it and use the Lock icon as pictured in the Lock Homepage Modules section above. Changes to a template do not apply to sites that had previously selected that template. In those cases, either edit the homepage of the site or select the updated template again, via the Site Center. Keep in mind that the contents of the homepage are reset when a new template is selected. Although advanced rights allow customized CSS for individual modules, we highly recommend against using these tools without direct support from School Loop. Under the hood, SLS2 is a complex system and it's really easy to make mistakes when using these CSS tools. Please submit a support ticket if you need to customize the CSS for a module. If necessary, you can always revert to an earlier version of your homepage. This is the best way to recover from mistakes that are difficult to undo. 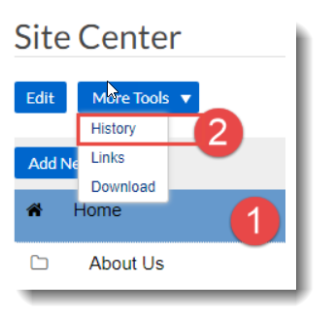 Go to the Site Center, click the homepage row to select it (1), then click the More Tools button and select History (2). Choose the previous version you wish to restore by first clicking on that row (3), then clicking Save as Draft (4). In your sitemap, the homepage will be restored as an open draft. You may now edit and publish as desired.